This is the beefed up version of the MG Comfort Bicycle, with 24x2.125" Worksman Clincher Rims, 11g spokes, reinforced step through frame and lots of options. For riders over 300 lbs, we recommend that you outfit this bike with the front drum brake upgrade, precision sealed crank set, kevlar belted tires, puncture resistant tubes and extra wide saddle (as shown in image). A great bike for hefty riders who want a safe, comfortable ergonomic riding position. This unique bike is a great choice. Many upgrades and choices are available to customize your Worksman Industrial Bicycle. **Notes about Carrying Capacities: While other companies put unfounded inflated weight capacity figures based upon no facts, we at Worksman Cycles actually put weight capacities far less than the true capabilities of the cycles, as we take into consideration not only what the cycle will be able to hold, but what is a safe operational weight. Heavier riders (over 275 lbs) should order the bike with drum brake upgrade as well as upgraded tires and tubes. Contact Worksman if you need assistance with configuring the bike that is right for you. We are available at cycles@worksman.com or by phone weekdays 9-5 EST at 800 962 BIKE. Worksman Industrial Bicycles are simply more durable than other brands and have a 100+ year track record to prove it. I ordered this bike 1 yr. ago w/ many of the accessories. I'm 5'8", have a 32-inch inseam and wear a size 10B women's shoe, weight 225. I have to raise the seat so high to comfortably ride that my toes just BARELY touch the ground when I'm on the seat & at a stop. The handlebars are then so low, I'm leaning over & my hands go numb. I had to add a 9-inch stem extension. With the extension (& large front basket), the front end now is tall enough (I guess) that the kickstand won't hold the bike up unless the front end is turned to the opposite side. My foot constantly hits the kickstand in its raised position when I'm riding, so I have to either ride pigeon-toed or with my foot too far forward on the pedal. I need pedal extenders. So maybe this bike is best for someone who is shorter, I'm not quite sure. Now the gear shift is acting up, have to go to 3 in order to finally get it to kick down to 1. My only experience w/ cust. serv. was EXCELLENT (replaced a seat for me INSTANTLY). 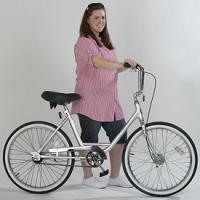 I was so thrilled to come across this site and see they have bikes for bigger people. I'm 6 ft. and weigh 360 lbs. and everyday bikes was either too short for my long legs... or I just didn't feel confident enough to ride because of my weight. My bicycle came in quicker than I thought,,, and my father put it together before I even got home! I changed and was out enjoying the outdoors within 5 minutes. After a week of riding ,,, I already lost 13 lbs!! I feel safe and secure,,, and the bike is beautiful,, I got pink! So vibrant. Worksman employees was so nice and helpful. If I had any questions they was very professional. My father said the way the item was shipped was top notch! also putting together was a breeze. Thank you Worksman Cycles for offering a great product. I LOVE MY NEW BIKE! I bought mine used off Craigslist to accommodate my age (70), medical, and balance issues. The wide footprint and step thru frame solved those problems. My friend who manages a bicycle shop, laced a Shimano Nexus 3 speed hub into the rear wheel and installed an Odyssey bmx front caliper brake. I'm about to install a 170 mm crank as I need more leverage for my long legs. I'm good to go ... all day if I want to. This bike is very heavy but the 3 speed hub defeats the weight. And sturdy, mercy, I believe it could survive a direct nuclear hit. After owning dozens of bikes in my life I can highly recommend this American made horse to anyone who loves to ride. And initially, if it's not to your liking, it's easy to customize without sacrificing any quality. Received the bike in three boxes. The bike was in good shape, including the basket. I suggest having a professional assemble the bike. The directions are hard to follow unless you know the bike lingo. The bike itself is really well made, very sturdy, and looks to be of high quality. For anyone who claims there are paint issues, my bike looked great. Cosmetics are secondary to the quality of material for me though. I would purchase through Worksman Cycles again, very courteous and helpful when I made the order. Overall, the experience of purchase and the shipping and product were great. After spending nearly $900 on a bicycle, I expected it to at least come with a kickstand; I did not realize that needed to be explicitly ordered. The other surprise for me was the amount of assembly required. I did not expect to have to do almost half of the assembly. It is a nice bike, but I'm not sure it's worth price, particularly when I had to pay a local shop to ensure i assembled it correctly and to have them put a kickstand on. Regretably, unless the person purchasing the bike is experienced at assembly, I would probably not recommend a purchase from this manufacturer. I have struggled with my weight almost my whole life. When I made the decision to lose weight I tried to think of what I could do that was fun and wouldn't hurt me (I have a chronic illness called fibromyalgia that causes wide spread pain and fatigue). I thought back to my childhood and remembered riding my bicycle and wanted that feeling again. Workmans bikes has given me a way to be active where other cycles failed, either by not being able to support my weight or by being prohibitively expensive. I am forever grateful. My wife and I both got these bikes and we love them! It's so nice to be able to sit up and ride rather than hunching forward. The quality with which these bikes were made is noticeable and they are very sturdy. I don't have to worry about this bike breaking under me. Everything about getting these bikes from the purchase to the packaging was extremely professional. You can tell that the company takes great pride in every bike they produce. My wife and I love our new Worksman Cycles. They are incredible quality and the local bike shop, who did the assembly, told us that we made a great choice, the bikes were a "pleasure to assemble", and the seat was the most comfortable he has ever felt. I've lost 10 pounds this month just riding bike. Customer support after the sale has been incredible and, although this was the most money I've spent on a bicycle, it was worth every penny. I quality of the materials was good, and the customer service was...fun. They have a sense of humor, and are committed to their jobs. The frustration was caused by poor assembly directions. Some parts are metric, some english, and it took a full tool box to get it together. Some areas which seemed totally logical were clearly explained, while come complex areas were not. Photos or sketches would help a lot. I bought this bicycle for my boyfriend, he weighs 485# so we didn't think we'd be able to even find a bicycle that could accommodate him. Obviously, his mobility suffers due to all of this weight, so taking it off is quite the obstacle, but he loves this bike so far and is actually not pained by riding it. Looking forward to it giving him his quality of life back! !